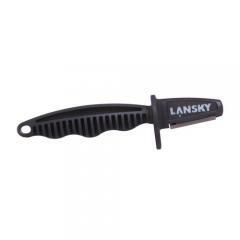 When needing to sharpen a blade in the field, rely on the Axe and Machete Sharpener from Lansky. Designed as a portable all-utility tool for smokejumpers, the sharpener quickly and safely renews the edge of dull or damaged hatchets, machetes, shovels, lawn mower blades, gardening tools, axes and other utility tools with a long-working edge. The sharpener has a durable tungsten carbide sharpening head that restores a sharp edge with just a few strokes on either side of the blade. Weighing under three-ounces, Lansky's sharpener is portable enough to throw in a pack or bail out bag.